CB could use a little less beldam in his life. 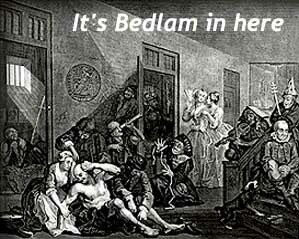 Although when you look at pictures of what bedlam apparently looked like when “bedlam” was the word of choice, it’s kind of appealing. I’m not really sure why, it’s appealing but drawings in black and white always seemed fun to be in. As far as I am concerned, life back then was actually black and white as well as cartoony so please don’t try to convince me otherwise because I won’t have it. This entry was posted on August 5, 2008 at 9:22 pm and is filed under Uncategorized. You can follow any responses to this entry through the RSS 2.0 feed. You can leave a response, or trackback from your own site.